Calvary Presbyterian Church was placed on the National Registry of Historic Places and the registry of San Francisco Designated Landmarks in 1978. Completed in 1869 and moved brick-by-brick in 1902 to its current location in Pacific Heights, it was completed just 26 months before the devastating San Francisco 1906 earthquake that destroyed its previous Union Square location. 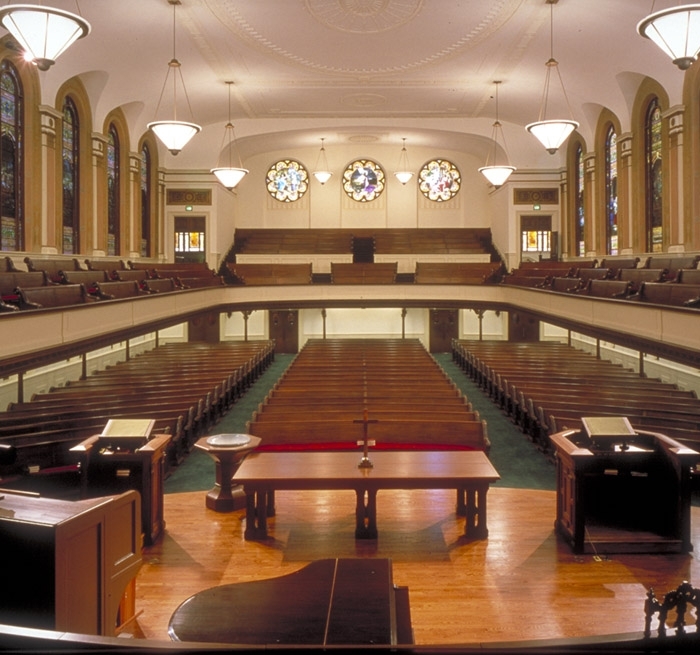 The church, in addition to worship services and religious events, hosts an active concert and lecture series. Auerbach Glasow provided architectural lighting design and custom pendant design for the sanctuary for the church’s major renovation. The contemporary pendant fixtures were designed in sympathetic harmony with the historic interior. The lighting was designed for flexibility and ease of operation to accommodate the various events. In 2013, Auerbach Glasow consulted on the LED retrofit of the sanctuary and chapel.